Undated and unsigned, this oil sketch is inspired by Tom Thomson’s dazzling depictions of the landscape around AlgonquinPark and Georgian Bay. Thomson’s influence is felt in the expressive brushwork and strong contrasts between autumn trees and dark hills, and in the impasto technique which layers paint thickly on the canvas surface. 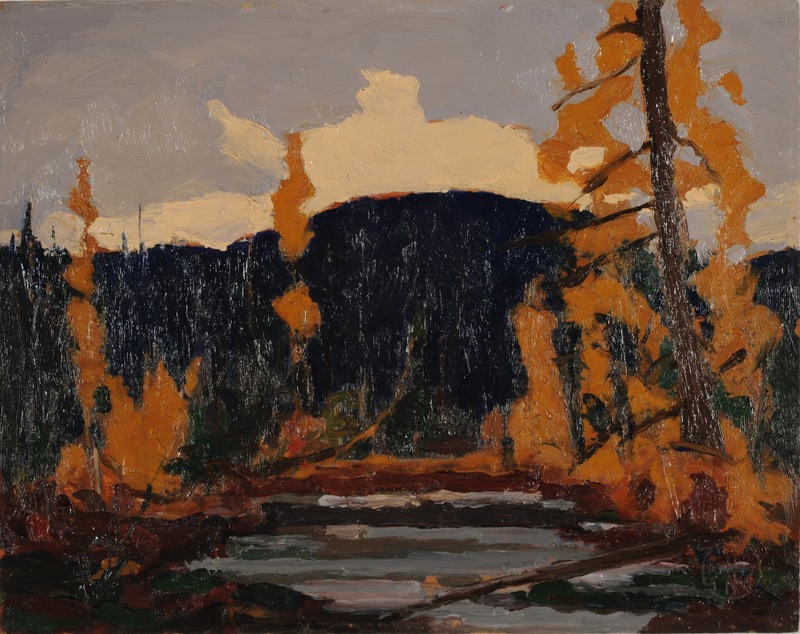 Thomson’s 1916 oil sketches of blazing tamarack trees may be closest to this work in terms of colour palette and subject matter. However, the untitled sketch lacks much of Thomson’s energy as well as his bold application of paint. 1. Lawren Harris, The Story of the Group of Seven (Toronto: Rous and Mann, 1954), 7. 2. [c. December 1930], draft, in Milne Family Papers.